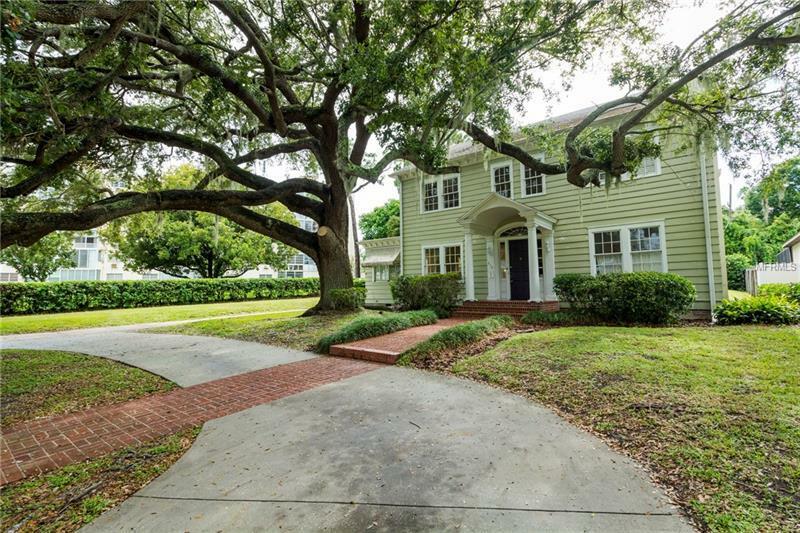 * * * RARE.....RARE.....RARE opportunity to own a colonial style home that has a wonderfully laid out floor plan * * * Enter the home into the grand foyer. To the left you will have an extremely large living room with fireplace and glass enclosed sitting room off to the side. Formal dining room is off to the right of foyer with access back to the oversized kitchen. 4th bedroom is on first floor and is a full suite with walk-in closet and full private bathroom. Great for guests or in-laws! Second floor has the main master suite along with 2 additional bedrooms and bathroom. There is also a 17x7 office off the second floor landing * * * OVERSIZE SCREENED POOL off the rear of home * * * HUGE lot that is 175â deep that allows for the home to be sit back far enough from street to have a front circular driveway. Main driveway runs on the left side thru a wood gate to the BONUS DETACHED 4 CAR STALL GARAGE ! Lots of options available with this building. Presently set up with a workshop on one side, garage in middle and an inlaw suite with full bathroom on the side closet to pool. Side yard is very large both in front and back of driveway gate which allows plenty of room to play. Directly across from Clearwater Golf Club. Beautiful views from front porch. Easy access to get to Clearwater Beach & their world famous white sand beaches, restaurants and stores. Copyright © 2019 Mid Florida MLS. All rights reserved. The data relating to real estate for sale on this web site comes in part from the Internet Data Exchange Program of Mid Florida MLS. Information provided is for consumer's personal, non-commercial use and may not be used for any purpose other than to identify prospective properties consumers may be interested in purchasing. The Madco Group participates in the MFRMLS Internet Data Exchange (IDX) program, allowing display of other MFRMLS broker's listings on this site. However may not include all listings currently available. Information is deemed reliable but not guaranteed. Information last updated at 2019-04-19 14:18:13.